Yichao Wang passed away at 4:30pm on Feb 19th 2010 peacefully. 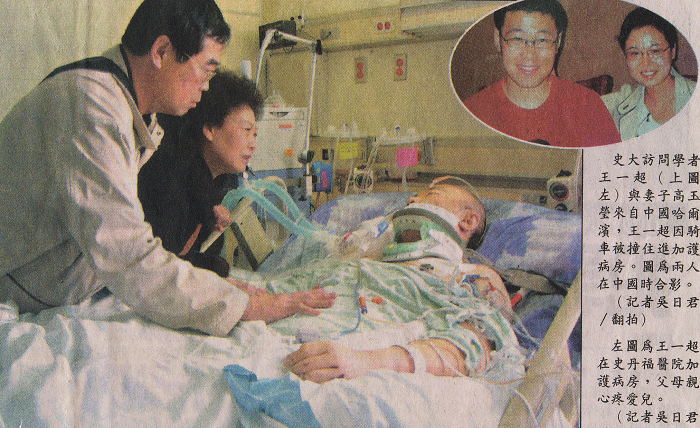 Yi-Chao's insurance benefits were exhausted by the surgery,and cost of hospitalization has been a huge burden on Yi-Chao’s family. Yi-Chao's colleagues and friends are motivated and are doing their best to support Yi-Chao and his family. CMAIN organized a donation event from 02-10-2010 to 02-25-2010, raised over $50,000 donation from about 900 donors. We will transfer all these donations to Yichao family. The donation event deadline is 02-25-2010 11:59PM PST. Every year, many young foreign students come to USA, pursue their dream, but many of them are not familier with U.S rules, so many tragedies, so many broken hearts in so many related families. CMAIN established "Yichao Fund" . We will use it to improve Californian campus safety environment, with the goal of preventing traffic tragedy. We will distribute helmets, safety lights, brochure etc. and organize safety seminars in Universities periodically. We will try to keep this project running every year. If you'd like to donate to this fund, help our community, please visit http://www.paypal.com send your donation to: donation@cmain.org . You can visit our web site: http://www.cmain.org click the [DONATE] button in the middle. Please write your name, email address on the check, and make a note: "for Yichao Fund", so we can issue you a tax deductible receipt later via email. CMAIN is a non-profit 501 (C) (3) organizations, donations are tax deductible, including Microsoft, Google, Intel, Yahoo! and many other companies providing donation match. Specific reference to "How can I get company Match?" Or write email to : GPSFAN@CMAIN.ORG for any further questions.